Use an oven roasting bag to keep the meat moist without added fat. The juices from the turkey are then used to make a simple gravy. Preheat the oven to 190°C, gas mark 5. Place the unpeeled garlic in a small pan, cover with water, bring to the boil and cook for 20 minutes, until tender. Drain and leave to cool. Slip the garlic cloves out of their skins and place in a bowl. Mash with lemon zest, parsley, thyme and seasoning. Loosen the skin on the turkey breast by sliding your fingers underneath and, using a small palette knife, spread the garlic mixture underneath the skin. Secure the skin at the bottom with cocktail sticks. Place the turkey in the oven bag with the onions and seal with the tie supplied, making sure there is enough air in the bag to allow air to circulate. Snip a corner of the bag off to allow the steam to escape. Place in a roasting tin and cook for 45 minutes per kilo. Meanwhile, place the potatoes in a pan and cover with cold water. Bring to the boil and cook for 3 minutes, then drain well. Place the olive oil spread in a roasting tin and melt in the hot oven. Add the drained potatoes, making sure they are coated with the olive oil spread, and return to the oven for an hour. Turn the potatoes once or twice during cooking. When the cooking time is up, remove the turkey from the oven and cut open the bag. Test to see if it is cooked by inserting a skewer into the meat by the wing. If the juices run clear and there is no pink meat, it is ready: if not, return to the oven for a further 10 minutes then test again. Lift the turkey onto a carving plate, cover and keep warm. Pour the juices from the bag into the roasting tin, and place over a medium heat. Mix the flour with a little cold water to form a smooth paste, then pour into the juices in the pan, whisking all the time, until thickened and smooth. Add the chicken stock and simmer for a couple of minutes, then season to taste. Carve the turkey into slices and serve with the potatoes, gravy, steamed broccoli and another vegetable of your choice. 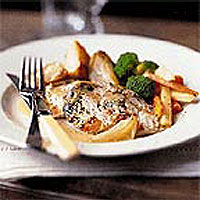 This recipe was first published in September 2001.